Interesting Sites | Explore Alexandria - Alexandria. Explore and Visit Alexandria, go for official information on travel, accommodations, hotels, history, food, culture and the best shopping, clubs and cultural events. Travel Guide to Alexandria. Alexandria has a lot to offer when it comes to historical sites which provides good opportunity for learning and entertainment. Visit charming historic forts and communities and Civil War plantations. Let’s start the getaway with the Christ Church. This Episcopal Church was built by Wren from 1767 to 1773. Robert E. Lee and George Washington are some of the historical figures who were able to attend this church. Christ Church can be found at 118 North Washington Street and opens from Monday to Saturday from 9 in the morning till 4 in the afternoon. Next stop is the Ramsey House built by William Ramsay, a Scottish merchant and a friend of George Washington, who later became a member of the Alexandria community. It served as a rooming house, a tavern and a cigar factory during the 19th and 20th centuries. Later it was bought by the city after being damaged by fire in 1942. This is now the Alexandria Visitors Center where most travel information about the city can be found including some maps and brochures. Try to visit Fort Ward, the 5th largest fort used by Washington as defense during the American Civil War. It used to be a Union Army Installation which until now was able to preserve 95% of its walls intact. For a combination of music, culture, history and places, American Musical Landscape has a lot to offer. Enjoy the scenic historical videos and photos with America’s most unforgettable songs of different regions from generation to generation. This includes shows presented at GW Memorial, with 350-seater Theater. And in order to simulate the mixture of African American experience, the Black History of Museum was built. It is composed of the Watson Reading Room, the Museum and the Alexandria African American Heritage Park. The Watson Reading Room is a good source for learning the cultural traditions of African Americans while the nine-acre Park presents fine place for reflection, celebration and commemoration. One of the highlights of the exhibit is Securing the Blessings of Liberty, which was one of the three exhibitions made in 2006. Friendship Firehouse Museum though was the first fire department volunteer built in 1774. It houses the historic fire equipment in Alexandria. Small city as it is, Alexandria is exciting not because of its high-tech settings like that of Silicon Valley but its nearness to Washington DC. George Washington Parkway or the Metro is a convenient way to get to the Federal Agencies. 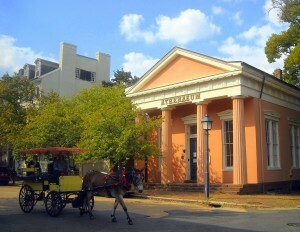 The city since it started in 1749, provides excellent transportation ever since.